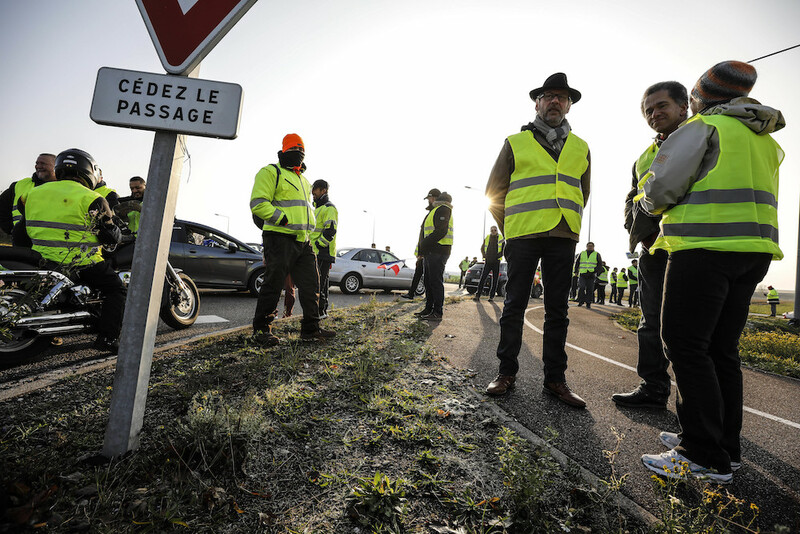 In mid-November 2018, citizens wearing yellow vests blocked a roundabout near Molsheim, in eastern France, to protest increases in gasoline and diesel taxes. Photo by Jean-Francois Badias/Associated Press. Just over 50 years ago, Jacques Tati’s Playtime opened in French movie theaters. In the comedy, Tati once again features his iconic character, Monsieur Hulot, the confused but courtly Parisian who confronts the challenges of a rapidly modernizing France. This time, Mr. Hulot tries to navigate the shining and sleek newly developed periphery of Paris, suddenly bristling with buildings and streets that are indistinguishable from one another. The camera captures the hopelessness of Mr. Hulot’s quest when it focuses on a rond-point, or traffic circle, around which slow-moving cars and buses, like brightly colored horses on a merry-go-round, circle endlessly. A half-century later, this Gallic version of the traffic roundabout has come to represent a grayer and grimmer France. Instead of lending carnival-like éclat to Tati’s circling vehicles, the rond-point now symbolizes the slow spiral of diminishing means and decaying hopes for Mr. Hulot’s everyman descendants. Since early November, many of these middle-class men and women, hailing mostly from the provinces, have formed a massive protest movement known as the gilets jaunes, or yellow vests, in reaction to President Emmanuel Macron’s economic policies, including increased taxes on gasoline and diesel. Wearing the bright yellow safety vests that French drivers must don when they are outside their cars on a public thoroughfare, these citizens of modest means have taken to the streets and boulevards—and particularly, the ronds-points—to protest their increasingly desperate social and economic conditions. In fact, the rond-point has taken on both a symbolic and strategic role in these protests—one that Tati would have appreciated. Were he alive today, Tati’s Mr. Hulot might well be wearing a yellow vest, protesting the plight of the everyman amidst the circling cars of modern France. To understand the sudden appearance of the gilets jaunes, it helps to consider the history of the rond-point itself. A familiar feature of France’s cityscapes, the rond-point has long been a source of awe and anguish to foreign visitors, particularly when, behind the wheel of a rental car, they must face the raging rapids that roar around the Place de l’Étoile and its monumental Arc de Triomphe. In fact, this particular rond-point, the brainchild of the unjustly forgotten urban planner Eugène Hénard, was the very first to be built in France. When he unveiled it in 1906, Hénard expected it would reduce the number of car and pedestrian accidents that occurred at the intersections for the dozen boulevards leading to the arch. Hénard was proved right: ronds-points are, on average, twice as safe for pedestrians and drivers than traditional intersections. What Hénard perhaps did not anticipate was how popular his invention would prove. There are now more ronds-points than different kinds of cheese in France; for that matter, there are more ronds-points in France than in any other country. More than 30,000 pockmark the French landscape, with 500 more added every year. But traffic safety alone does not explain the recent rash of ronds-points. City councils and mayors frequently spend significant sums of money—between 200,000 and 1 million euros—to transform the space within a traffic circle into publicity for their towns. Like three-dimensional billboards, the erection of statues or landscapes highlights local traits or wares. For example, the rond-point outside Bondy showcases a statue of black, brown, and white children, thus celebrating the Paris suburb’s ethnic diversity, while at the town of Tinchebray, the rond-point serves as pedestal for an immense rake and pail—not coincidentally, the products of the town’s single factory. But paradoxically, the blossoming of ronds-points also measures the blight of the French middle-class dream. Since the 1960s, the rise of ronds-points has accompanied the multiplication of housing developments located outside the country’s cities. Between 1968 and 2011, the exurban population in France has grown from 9.4 million to 15.3 million, with the vast majority settling in single residence homes. This demographic bulge represents the so-called rêvepavillon, or suburban dream. Like the dream itself, the pavillon is modest: a small dwelling that is indistinguishable from hundreds of neighboring houses, built on land that once was pasture or farmland. These are the very same French now wearing the gilets jaunes. The massive protest movement—an estimated 75,000 people blocked 580 roadways over one recent weekend—represents a dramatic shifting of the fault line between what the French sociologist Christophe Guilluy calls the métropole and périphérie. While the former is home to a highly trained and educated elite allergic to smoke and diesel, the latter is home to a struggling middle class alienated from these urban centers. This peripheral France—a socioeconomic as well as a geographic state—is, in effect, la France des ronds-points. In fact, the rond-point has now become a rampart for the yellow vests, who are underscoring that France remains a société bloquée—one dominated by the state, even as they challenge that power. By occupying hundreds of these traffic circles, they have turned them into impasses not just for cars, but also for the government as it seeks an exit from a deepening crisis. Paradoxically, the blossoming of ronds-points also measures the blight of the French middle-class dream. Inevitably, the recent scenes of pitched battles between black-helmeted vandals and shield-wielding police along the Champs Élysées, amidst flaming tires and thudding tear gas canisters, claimed the world’s attention. By the early morning of December 1, the historic boulevard, covered in a wintry mist, had again become the stage for social and political upheaval. For some commentators, it is yet another reminder that the French are better at making revolutions than reforms. But such claims simplify, if not falsify, a more complex reality. A closer look reveals that the vast majority of French have carried on the protests peacefully, at times joyously, at countless ronds-points across the country. They see them less as places of confrontation than reconciliation between those who use diesel and those who tax it. At a critical rond-point outside Gustave Flaubert’s native city of Rouen, the gilets jaunes, whose ranks are weighted towards women, have transformed the space into a camp site. Singing and chatting around a fire, the protestors are given food and support by the very commuters they are blocking. To the north, in the Flemish town of Hazebrouck, a few dozen gilets jaunes transformed their rond-point into an open grill. Protestors chipped in to buy an entire pig, which they roasted over a fire and invited everyone, including car drivers, to share. Hundreds of such events have taken place across France. It is as if these traffic circles are so many variations on the Royal Garden restaurant—the setting for the climax of Tati’s Playtime. Wedged into the restaurant’s streamlined and sterile décor, its patrons take matters into their own hands, rebelling against the room’s constraints by throwing a boisterous party. Worthy as the inheritors of Mr. Hulot’s legacy, the yellow vests are insisting on their humanity in a system that seems intent on ignoring it.